Defense lawyers filed motions Thursday asking U.S. District Judge James Spencer to acquit them, or at least order a new trial. Spencer presided over the nearly six-week trial, which included bombshell testimony that the couple was living separately, and that Maureen McDonnell was frequently texting and emailing the wealthy businessman whose gifts and loans to the couple were at the center of the case. 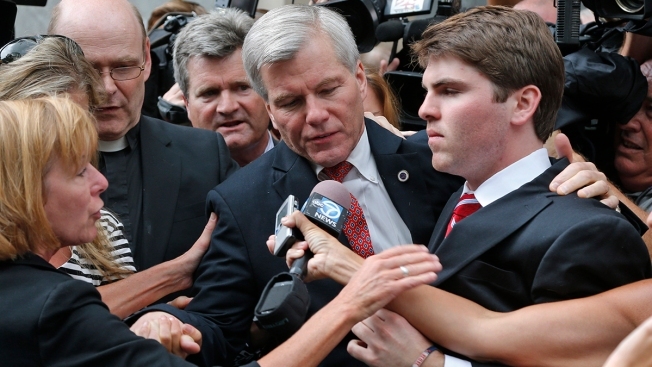 Earlier this month, a jury convicted Bob McDonnell on 11 counts and his wife on eight. The couple had been accused of accepting more than $165,000 in gifts and loans from former Star Scientific Inc. CEO Jonnie Williams in exchange for promoting his company's dietary supplements. Bob McDonnell was "broken" and "devastated," said defense attorney Henry Asbill, shortly after the verdict was read. Lawyers claim in the new motions that prosecutors failed to prove the McDonnells performed any "official acts" for Williams. The government has not yet responded. Sentencing is set for Jan. 6.